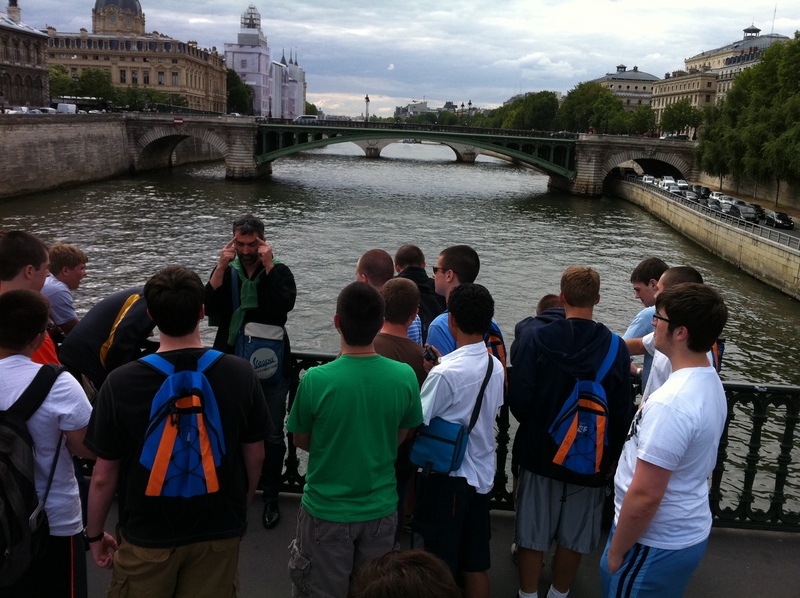 After lunch, we started a walking tour of Paris. 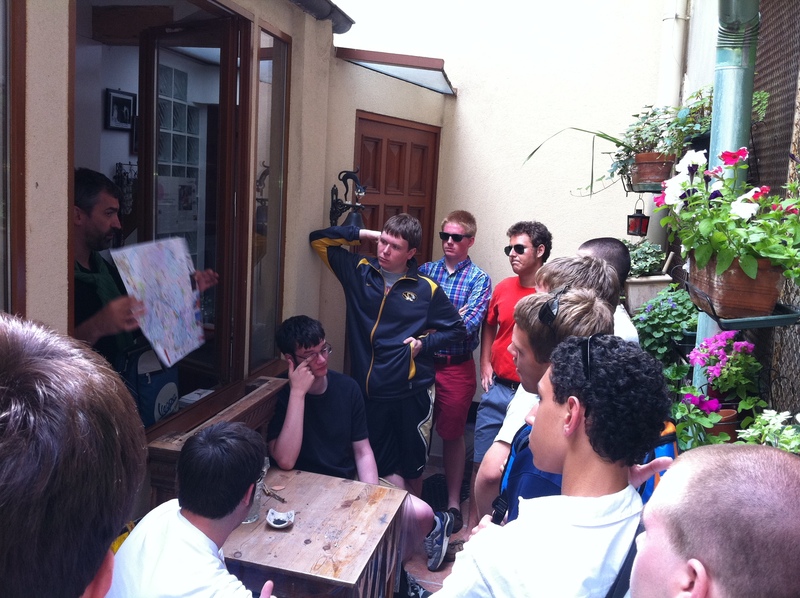 Since we were already in the 2ème, our guide offered to have us stop by his house right around the corner. He has the obvious good fortune of owning his own house, right in the very center of Paris. From the street, you open the oversized, watch-your-step kind of door and move into the entrée of what is actually an apartment building. Just beyond the entrance and access to the apartments, you happen upon his house. It’s a pretty quirky place, looks like it could be part of the décor of a Tim Burton movie. There are books absolutely everywhere, and the walls are covered with artsy posters. There’s a makeshift mezzanine, that he built himself, where books are stored on shelves. This is in the living room, which is pretty much the everything room. A ladder is at one’s disposition to gain access to the overhead books. In the living room, there’s also a small table and a high-chair, various toys lying around. It’s a well-used space. He was hospitable enough to allow anyone in our group use the toilettes. The stairway that leads to the bedrooms is only wide enough for one not-so-hefty person at a time. The rooms upstairs echo the wonderfully eccentric tone of the living room, and everything is lovely. The rest of the first day was spent walking around the Marais district http://goparis.about.com/od/sightsattractions/ss/MaraisTour.htm, one of Paris’ oldest and most gorgeous neighborhoods. It’s an historically Jewish area, and we stopped in front of a school where we read this plaque, erected in the memory of Jewish students who were deported between the years of 1942-1944. 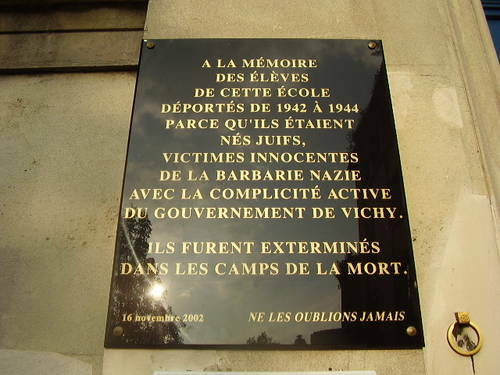 They were exterminated in concentration camps. I had my students do the translation on their own, and then our guide led us through a very comprehensive lesson on how this could have happened, and what led up to the war. It still gives me chills to remember the silence of my students while standing in front of this school, on the very sidewalk where so many children, now lost, once ran into school in happier days, hoping not to be late. By the time we had walked around the Marais, Île de la Cité http://www.aparisguide.com/ile-de-la-cite/index.html, and parts of the Quartier Latin http://en.wikipedia.org/wiki/Latin_Quarter,_Paris, it was time for dinner. It was not a very memorable occasion, as I recall. We went into a supermarket and bought picnic-style goods that could be thrown together quickly and eaten in hotel rooms. We were all thoroughly exhausted, but we made it through the first day! Tomorrow, everyone would be ready for our day trip to Chartres http://whc.unesco.org/en/list/81, where we would spend the day at French high school, L’Institution Notre Dame http://ind-chartres.fr/. Have a look at “Paris, Je t’aime (Part 3)” to see how our day at French high school went!